Riverside Tool & Die is a medium sized, comprehensive machine shop, capable of combining the quality and diversity of larger shops with the reasonable pricing, timely delivery and personal service of smaller shops. Established in 1986, we pride ourselves on our service and enjoy getting to know our customers’ individual needs and requirements. Riverside Tool & Die is also Women-Owned Small Business Administration Compliant, a member of the Peoria Chamber of Commerce, and a member of the Illinois Manufacturers Association. Precision machining of most all materials. 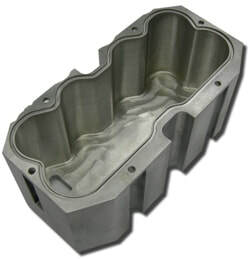 Manufacturing of tooling, prototypes, fixtures, dies, molds, gages. Tool design and documentation, drawings, reverse engineering, et al. Research and development of your processing needs. Whether your needs fall into the category of “a few in a hurry” or “limited production at a reasonable price”, our priority is to provide the items you need with the quality you demand, on the date agreed upon, at a competitive price. We would appreciate the opportunity to work with you on your upcoming projects!